Artnet Auctions is conducting a special sale of Diane Arbus Photographs through August 4. Coinciding with The Met Breuer's exhibition of her early works, diane arbus: in the beginning artnet is auctioning 10 Arbus prints. Diane Arbus. Two Ladies at the Automat, N.Y.C. (1966). The image above is a 15x14.5-inch gelatin silver print in a 20x16-inch frame, stamped "A Diane Arbus photograph," signed, titled, dated and numbered by Doon Arbus, administrator, in ink, with estate copyright credit stamps and annotations in pencil on the reverse. It was printed in 1980 in an edition of 75 by Neil Selkirk. The opening bid is set at $18,500 with an estimate of $20,000 to $30,000. 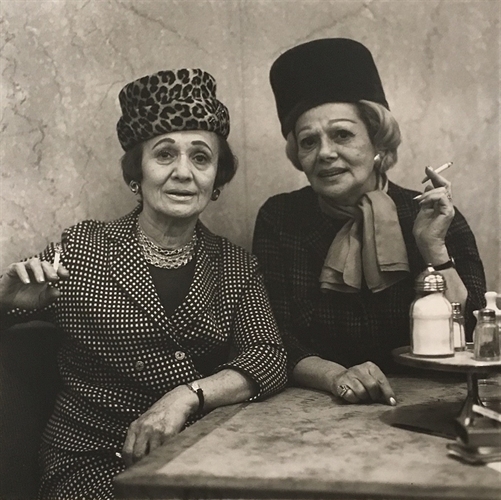 Diane Arbus' images of individuals on the outskirts of mainstream society convey both her fascination with and her compassion toward her subjects. We featured a video on Arbus as part of our Saturday Matinee series. In fact, it was the second one we published. To view all of the works for sale as well as their details, visit the auction site.